A Step for Forward for Orthodox Women! 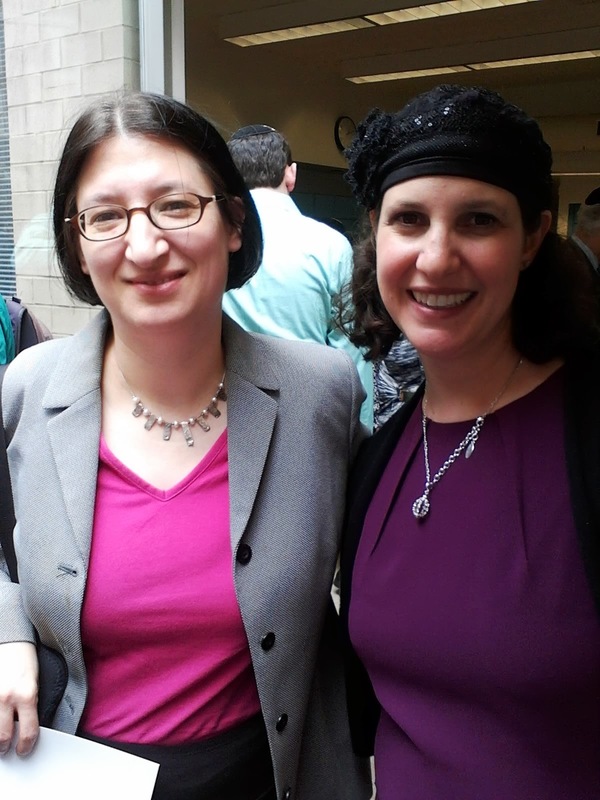 The Hadassah Foundation attended the inaugural ordination ceremony at Yeshivat Maharat, the first institution to train Orthodox women for religious leadership. All three women ordained yesterday have jobs--mazel tov! And a hearty mazel tov to Rabbi Sara Hurwitz, Yeshivat Maharat's Dean and this year's winner of the Foundation's Tannenbaum Prize--she was positively kvelling yesterday. Attendees included Rabbi Jackie Koch Ellenson, the former Board Chair of the Hadassah Foundation; her husband, Rabbi David Ellenson, the President of Hebrew Union College--Jewish Institute of Religion; and Rabbi Sally Priesand, the first woman to be ordained by HUC. The Hadassah Foundation presented Rabba Sara Hurwitz, the Dean of Yeshivat Maharat, the first Orthodox institution to train women for religious leadership, with the Bernice S. Tannenbaum Prize on June 11. The Prize honors an outstanding young leader who advances the status of women and girls in Israel or the United States. Named in honor of Bernice S. Tannenbaum's lifetime of service to Hadassah, the Women's Zionist Organization of America, the Tannenbaum Award connects the recipient to the accomplishments of Tannenbaum, who served as Hadassah National President from 1976-80. In the late 1990s, Tannenbaum chaired Hadassah's Strategic Planning Committee that proposed the creation of the Hadassah Foundation, and she now serves as the National Board's liaison to the Hadassah Foundation. The Prize was conceived and implemented through generous contributions from Joan and Leonard Leiman with additional funding provided by The Philip and Muriel Berman Foundation. The Hadassah Foundation Board, with Rabba Sara Hurwitz, center. together with other women's organizations), at least 4 out of 11 members of the selection committee have to be women. over Jewish marriage and divorce cases--it is critical that women play a role in the selection process, especially since the (Orthodox) judges are all men." Hadassah, the Women's Zionist Organization of America, released a statement praising the development. You can read it here.